UCANews.com, a Catholic news source serving the Asian region, carried a commentary article titled “China’s genocide unlike any other” by Benedict Rogers on April 4, 2019. Benedict Rodgers is deputy chair of the U.K.’s Conservative Party Human Rights Commission, East Asia team leader at human rights organisation CSW, and an adviser to the International Coalition to End Transplant Abuse in China (ETAC). Mr. Rodgers wrote that forced organ harvesting in China had been difficult to prove because the only living witnesses are the perpetrators: the doctors, the police and the prison officers involved. Any evidence left in a surgery room is quickly cleaned away after an operation. It has been called an “almost a perfect crime” because no victims have survived to testify. “That has led investigators to the conclusion that prisoners of conscience are the source. ‘The end of this crime against humanity is not in sight,’ they conclude. ‘The ultimate conclusion is that the Communist Party of China has engaged the state in the mass killings of innocents … in order to obtain organs for transplants,’” Mr. Rodgers wrote. 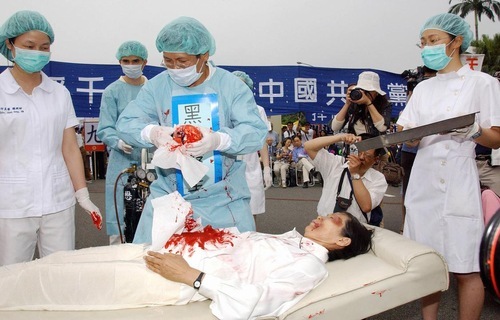 Falun Gong practitioners in Taipei stage a reenactment of the Chinese Communist Party’s state-sanctioned live organ harvesting on April 23, 2006. Mr. Rodgers wrote, “Some countries, particularly Israel, Italy, Spain and Taiwan, have banned ‘organ tourism’ to China, and Canada’s Senate has legislated to do the same.